Prince Hamlet (August Diehl) just returned to Denmark after his father’s death. His mother Gertrud (Andrea Clausen) has quickly remarried – and who else but Hamlet’s uncle Claudius (Roland Koch)? 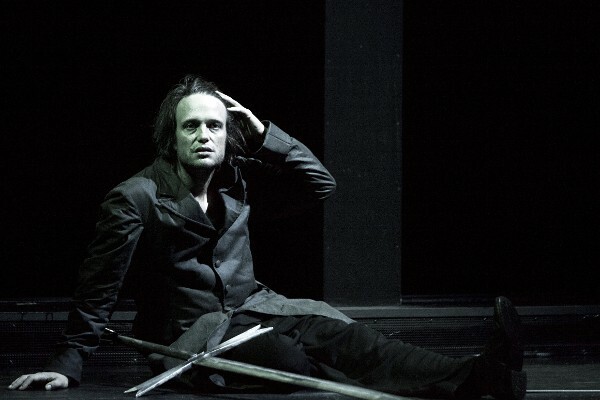 But Hamlet’s father (Hans-Michael Rehberg) still haunts the castle grounds and he tells Hamlet that it was his own brother who killed him. Now it’s upon Hamlet to set things right again. But Hamlet’s grasp on sanity is slipping. Or maybe that is all a ruse? I’ve heard good things about this production of Hamlet and I’m a big fan of August Diehl, so I knew that I had to go and see it, despite it being over five hours long. Unfortunately it was a disappointing experience.